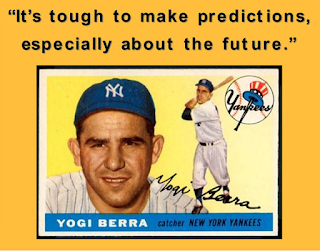 This week Yogi Berra passed away and Pope Francis visited the United States. It's a toss up which event affected me more. For solace I reached for my copy of The Yogi Book: "I Really Didn't Say Everything I Said!" This Yogi-ism jumped out at me, "If the world were perfect, it wouldn't be." Explaining what he meant, Yogi said "I believe you have to take the good with the bad, otherwise how do you know when things are good? If the world were perfect, how would you know?" That Yogi-ism reflected perfectly how I am feeling this week after participating on Apollo Kauai's panel entitled, "LNG and Kauai's Energy Future?" Having been labeled an environmentalist throughout my political career some now have found my positions on energy confounding and asked why the change. I don't think I have changed, just that I have always preferred to have pragmatic rather than ideologue precede the environmentalist label. I understand that most peoples' opposition to liquified natural gas (LNG) are based on their opinion on fracking. But sometimes you have to take, not the good with the bad like Yogi said, but the bad with the good to get to the best. Hawaii's clean energy transformation is not a straight shot to the perceived good of 100% renewable. And, 100% renewable isn't 100% clean either, it still relies on lots extraction of elements and industrial manufacturing amongst other things. So according to Yogi Berra, if the world was perfect, it wouldn't be and I agree. Getting caught up in the excitement of the papal visit, I wanted to learn more about Pope Francis' Laudato Si, the encyclical or papal letter to the Bishops of the Catholic Church. Searching the internet I came across this article, entitled, "Danger of Turning Faith Into Ideology" written by the Reverend David Lewis, an assistant professor at Providence College, a Catholic University. Here's an excerpt below and here's how I think it speaks to Hawai's energy transformation. If Hawaii energy transformation is not grounded in reality (based in economics and technology) and only "breathe the heady air of the moral high ground" we are doomed to making this effort an elitist endeavor with the likelihood of placing the burden on those who can least afford it. But best of all, here is an encyclical that enables even non-Catholics to hold two antitheses simultaneously. They can extol its demands as costly grace -- and sacrifice absolutely nothing. They can breathe the heady air of the moral high ground -- and never leave home. They can be spiritual -- without being religious. At long last, they can bask in the approbations of their non-Christian neighbors, all the while reassuring them that Jesus demands nothing more than what common sense already acknowledges. They can work up a lather of indignation, all the while comfortable in the knowledge that they are preaching to the choir. And they can denounce corporate greed with a fine self-righteousness, since they are denouncing nothing more than an insubstantial generality. I’ll leave it to the theologians and scientists -- I am neither -- to figure out the strengths and weaknesses of Pope Francis’ Laudato Si. Given the glacial flow of church history, this encyclical will not assume a definitive shape for at least another century. But as the ideologues clamber aboard the popemobile, we should remember the one temptation to which Christianity has been prone from its very beginnings. Christians are forever tempted to turn their faith into a self-serving ideology. They always forget: Where faith thrives on ambiguities and aporias, an ideology is convinced it can hold onto truth like a dog on a short leash. Where faith asks of the Christian what William Blake called ceaseless mental fight, an ideology requires simply mindless assent. Where faith understands life as transient and perishable, an ideology would make this earthly life a permanent home. And where faith never knows of a grace that isn’t costly, an ideology renders all things cheap, even grace. I can't even begin to tell you how this resonates me! All of this moral high ground talk when it's the Sherpas carrying your 1st world stuff. If one brings up LNG as an interim measure to lower carbon footprint, it is often viewed as if one is in favor of a hot planet. And yet, without any irony, the ideologues are using their devices, sitting in their airconditioned quarters, safe in their lives of 24-hour medical service, clean water when you turn on the tap, sanitation systems that work most of the time, etc etc. Oooh don't get me started! One question: I had read that the RPS standard of 100% renewable doesn't mean that all generation will be 100% renewable--you could reach that benchmark with 50% renewables and 50% HECO fossil fuel sales. Is that right?